[RetroComputers] The Class of November ’82 – I ❤ Old Games! As I stated in one of my post earlier this year, 1982 was the year of the bloom of the home computers. Acorn BBC Micro, ZX Spectrum and Commodore 64 were all launched during 1982 and they contributed to define the image of the home computer: from now on the computer wasn’t the bulky hyper expensive thing used by military forces or university anymore but started to become an affordable and easy to use mass product. A lot of computers have seen the light during the year and this means that a big number was releqased each month, so in this post, instear of focusing on just one product I thought it would have been better to cite the most important machines released in November or 35 years ago. After Fujitsu released in 1981 its second home computer, the FM-8, the first of the FM series, the company decided to build two different computers to replace it: one aimed to the general public, the FM-7 and one aimed at the business, the FM-11. 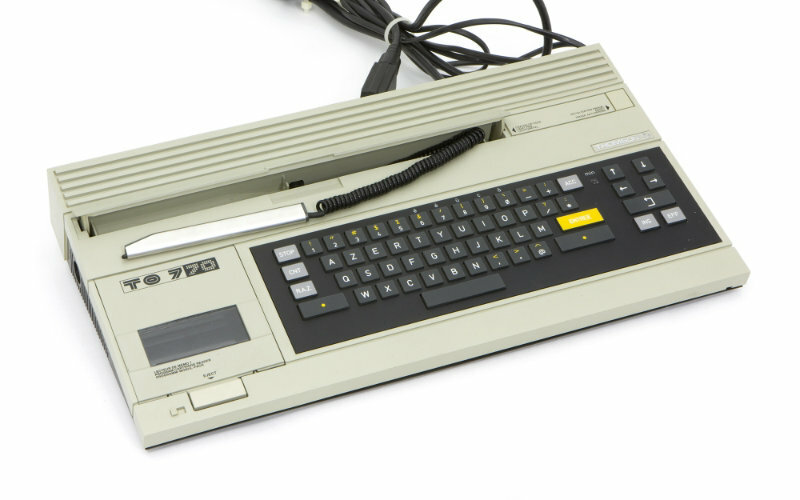 The computer was released to compete with the Sharp X1 and NEC PC-8801 and was based on the Motorola 6809 CPU as it was for the TRS-80 with which was partially compatible and had 64k of RAM, a screen resolution of 640×200 and 8 colors. The operative system was the OS-9 and the computer included an improved versiopn of the BASIC known as F-BASIC. On its side it had a 3-channel (AY-3-8910) sound chip. 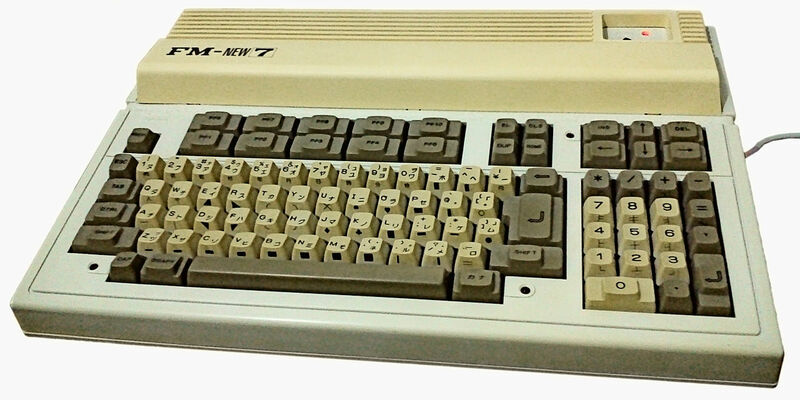 Several different version of the FM-7 version were produced until 1988, with the last featuring 192k of RAM. Known in the UK as CGL M5, Sord computer was released in Japan and it gane and was strangely popular in Czechoslovakia. 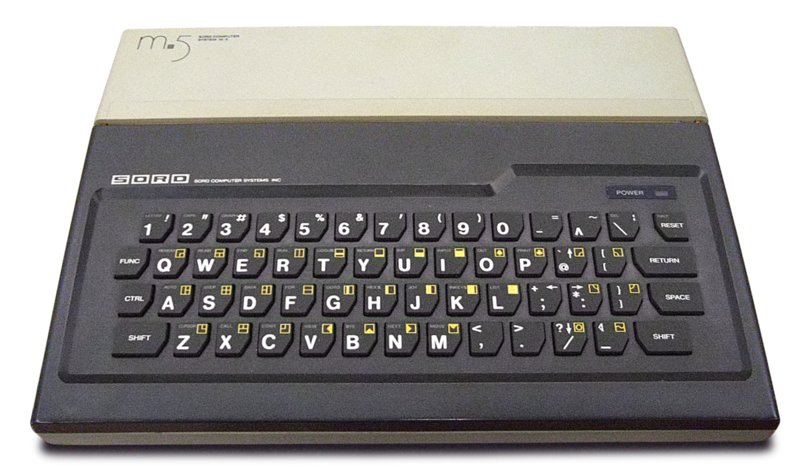 Aestethically it has some features that remin the ZX Spectrum, like the rubber keboard and inside it shared the most populat CPU of the times, the Z80 in its “A” version, clocked @3,58MHz. It wasn’t an MSX computer and that is the reason why it was quickly outclassed by other computers with the japanese standard . Despite its very short lifespan, two of the major softuare companies in Japan, Namco and Konami. The processor inside is a Motorola 6809 clocked @1MHz, so considerably slower than the other computers of the time. It runs MS Basic and it comes with a membrane keyboard à la ZX81 and a built-in light pen along with a cassette player on the left. The original version with 8K of RAM was replaced in 1984 by an improved one with 64k of RAM, the TO7-70. Despite my hate for french stuff, I think this is one of the computer I’ll most likely buy in the next months, since it can be found easily and is not so expensive.